According to the World Bank, “The global economy is experiencing a cyclical recovery, reflecting a rebound in investment, manufacturing activity and trade.” In the World Bank’s latest Global Economic Prospects publication, it projects 3.1 percent growth in worldwide GDP in 2018, improving from 2.4 percent and an estimate of 3.0 percent in 2016 and 2017, respectively. More importantly, it adds, “Global growth is expected to be sustained over the next couple years—and even accelerate somewhat in emerging market and developing economies….” Of course, there are also some downside risks to note, including tighter monetary policies and policy and geopolitical uncertainties. Nonetheless, the larger narrative globally is that the economic outlook has strengthened considerably, with the manufacturing sector expanding at new record or multiyear highs in many markets. Along those lines, the J.P. Morgan Global Manufacturing PMI rose to its best reading since February 2011 on robust gains in new orders, output and employment. In December, all but one of the top-15 markets for U.S.-manufactured goods expanded. (There is no manufacturing PMI for comparison purposes for Belgium, which is our 10th-largest trading partner.) South Korea contracted ever so slightly, ending three months of expansions. It is hoped sentiment in the South Korean economy will rebound in the January data. Along those lines, future output signals modest growth for the first half of 2018. Europe continued to dominate the list of the top export markets with strong manufacturing growth. In fact, the IHS Markit Eurozone Manufacturing PMI grew to its best reading since the survey began in June 1997. In reaching this new milestone, demand and production both accelerated to 17-year highs. In addition, manufacturing activity in Austria, Germany and Ireland reached their own all-time highs, with the headline index in France at its best reading since 2000. Moreover, the good news was not limited to sentiment surveys. Real GDP in the Eurozone rose 0.6 percent in the third quarter, or 2.6 percent year-over-year, the quickest pace since the first quarter of 2011. The unemployment rate fell in November to 8.7 percent, its lowest level since January 2009. Stronger economic growth and improved labor market news likely boosted spending, with retail sales up 1.5 percent in November and 2.8 percent over the past 12 months. Turning to our largest trading partner, the IHS Markit Canada Manufacturing PMI inched up to a three-month high, expanding modestly and reflecting notable progress from one year ago. Much of that improvement has come from stabilization in energy markets, but the global economic turnaround has also helped. Along those lines, the unemployment rate fell to 5.7 percent in December, its lowest rate “since comparable data became available in January 1976.” Yet, manufacturers lost 3,600 workers on net for the month. In 2017, however, the sector added 85,700 employees. In addition, retail spending jumped 1.5 percent in October, with Canadians spending a whopping 6.7 percent more over the past 12 months. With that said, real GDP growth eased to 0.4 percent in the third quarter, with 1.7 percent growth at the annual rate, down from 4.3 percent in the second quarter. Most importantly, U.S.-manufactured goods exports have improved so far in 2017, trending in the right direction through the first 11 months of 2017. This is a welcome development after weaker data across the past two years. Using non-seasonally adjusted data, U.S.-manufactured goods exports totaled $999.84 billion year to date in November, up 4.19 percent from $959.65 billion one year ago. Economic strength in international markets has helped, but a “cheaper” dollar has also been a factor in improving the export picture. The trade-weighted U.S. dollar index against major currencies from the Federal Reserve Board fell 8.6 percent in 2017, even as it remains 15.5 percent stronger than the levels in June 2014. The administration has undertaken several enforcement investigations, with reports and action expected early this year. Manufacturers are seeking congressional approval of the Miscellaneous Tariff Bill (MTB) and the four nominees to the Board of the U.S. Export-Import (Ex-Im) Bank. Negotiators are preparing for the sixth round of talks to modernize the North American Free Trade Agreement (NAFTA), although big differences remain on several U.S. proposals. U.S. and Korean negotiators also met to improve implementation and potentially modify the U.S.–Korea (KORUS) Free Trade Agreement (FTA). Global manufacturing expanded in December at the fastest pace since February 2011. J.P. Morgan Global Manufacturing PMI rose from 54.1 in November to 54.5 in December. The underlying data all increased for the month. New orders (up from 55.2 to 55.8), output (up from 55.0 to 55.6), exports (up from 53.7 to 53.8) and employment (up from 52.8 to 53.1) accelerated in December, with demand and production expanding at the best rate since February 2011. Similarly, hiring grew at a pace not seen since March 2011. Looking ahead six months, manufacturing leaders remained very upbeat in their global outlook, with a slight improvement in December’s index for future output (up from 63.1 to 63.8). Readings greater than 60 suggest robust growth in overall production for the next six months. South Korea contracted ever so slightly in December (down from 51.2 to 49.9), ending three months of expansions. It is hoped sentiment in the South Korean economy will rebound in the January data. Along those lines, future output signals modest growth for the first half of 2018, albeit slightly slower than in the prior survey (down from 58.5 to 58.0). Meanwhile, Europe continued to dominate the list of the top export markets with strong manufacturing growth. Those countries with the highest PMI readings in the sector in December included Germany (up from 62.5 to 63.3), the Netherlands (down from 62.4 to 62.2), France (up from 57.7 to 58.8), the United Arab Emirates (up from 57.0 to 57.7), Taiwan (up from 56.3 to 56.6) and the United Kingdom (down from 58.2 to 56.3). The U.S. dollar fell 8.6 percent in 2017, helping to improve international demand for U.S.-manufactured goods. The trade-weighted U.S. dollar index against major currencies from the Federal Reserve Board has fallen from 95.7228 at the end of 2016 to 87.4741 at the end of 2017. This index reflects currency units per U.S. dollar, suggesting that the dollar can now purchase less than it could before and vice versa. With that said, the index registered 75.7513 on June 30, 2014, illustrating the dollar’s continued strength, up 15.5 percent over that time frame. 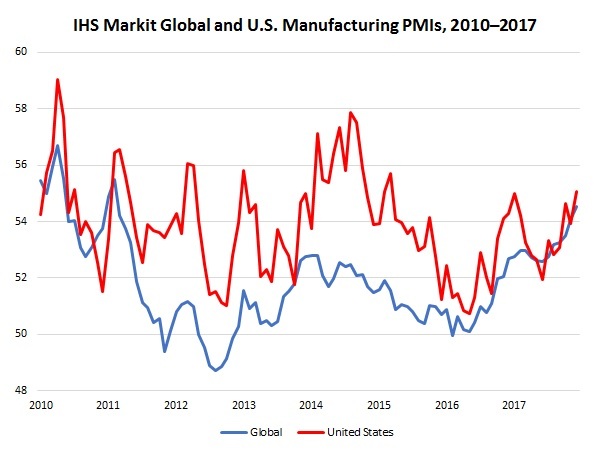 For manufacturers, growth in the dollar’s value over the past three years presents a real challenge as firms seek to increase international demand. Nonetheless, that drag has lessened across the past year, with a sizable depreciation in the dollar in 2017. The “cheaper” dollar in 2017 has helped manufacturers in the United States better compete in export markets. For manufacturers, exports have trended in the right direction through the first 11 months of 2017—a welcome development after weaker data across the past two years. Using non-seasonally adjusted data, U.S.-manufactured goods exports totaled $999.84 billion year to date in November, up 4.19 percent from $959.65 billion one year ago. This reflects better year-to-date figures to the top-six markets for U.S.-manufactured goods: Canada (up from $245.70 billion to $259.19 billion), Mexico (up from $210.65 billion to $223.27 billion), China (up from $103.92 billion to $116.70 billion), Japan (up from $57.58 billion to $61.26 billion), the United Kingdom (up from $51.00 billion to $51.53 billion) and Germany (up from $45.00 billion to $48.61 billion). Note that TradeStats Express from the U.S. Commerce Department reported 4.16 percent growth year to date in seasonally adjusted data through the first three quarters of 2017 relative to the same time frame in 2016. Manufacturing activity in the Eurozone reached a new all-time high. The IHS Markit Eurozone Manufacturing PMI increased from 60.1 in November to 60.6 in December, its best reading since the survey began in June 1997. New orders (up from 61.4 to 61.5) and output (up from 61.0 to 62.2) accelerated in December, with growth in both measures at 17-year highs. The pace of hiring expanded once again at an all-time high, matching the level in the prior report (unchanged at 58.2). Export orders remained robust despite easing slightly from its record high (down from 60.7 to 60.6). At the same time, expectations for future output rose in December (up from 65.5 to 67.6) to its fastest rate since the question was added to the survey in July 2012. As noted earlier, many of the best PMI readings globally occurred in Europe, showing how much the continent’s economies have turned a corner over the past year. Manufacturing activity in December reached all-time highs in a number of markets, including Austria (up from 61.9 to 64.3, with the survey beginning in 1998), Germany (up from 62.5 to 63.3, best since 1996 start) and Ireland (up from 58.1 to 59.1, best since 1998 start). In addition, the headline index was at or near a 17-year high in both France (up from 57.7 to 58.8) and the Netherlands (down from 62.4 to 62.2), and Greek manufacturers cited their strongest conditions since June 2008 (up from 52.2 to 53.1). Beyond those markets, manufacturing activity remained strong despite decelerating at year’s end from multiyear highs in the November survey in the following markets: Italy (down from 58.3 to 57.4), Spain (down from 56.1 to 55.8) and the United Kingdom (down from 58.2 to 56.3). Real GDP in the Eurozone rose 0.6 percent in the third quarter, off slightly from a gain of 0.7 percent in the second quarter. That translated into 2.6 percent growth year-over-year, the quickest pace since the first quarter of 2011. In addition, industrial production increased 1.0 percent in November, led by strong gains in output for capital, durable consumer and intermediate goods. On a year-over-year basis, industrial production has risen 3.2 percent. In a similar way, retail spending rebounded in November, up 1.5 percent after falling 1.1 percent in October. Over the past 12 months, retail sales have risen 2.8 percent. Stronger economic growth and improved labor market news likely boosted spending. Along those lines, the unemployment rate fell in November to 8.7 percent, its lowest level since January 2009. Canadian manufacturers ended 2017 with modest growth, with continued progress in the market from softness in both 2015 and 2016. The IHS Markit Canada Manufacturing PMI inched up from 54.4 in November to 54.7 in December, a three-month high. One year ago, the figure registered 51.8, with the Canadian economy improving significantly since then, buoyed by stabilized energy markets. In December, new orders (up from 53.9 to 54.6), output (up from 53.7 to 54.1) and exports (up from 49.4 to 50.6) accelerated, with the latter expanding for the first time since September. Hiring remained decent despite easing somewhat for the month (down from 55.8 to 54.8). In addition, manufacturers in Canada are very optimistic about production growth over the next six months, with the future output index edging higher (up from 63.9 to 64.3). The regional data increased for the most part, with improvements in Alberta and British Columbia (up from 57.3 to 57.7), Ontario (up from 53.2 to 54.9) and Quebec (up from 51.7 to 52.3) but with a slower expansion for the rest of Canada (down from 52.8 to 51.1). Real GDP growth eased from 1.0 percent in the second quarter to 0.4 percent in the third quarter, largely on weaker export data. That translated into 1.7 percent growth at the annual rate, down from 4.3 percent in the second quarter. Moreover, manufacturing sales decreased 0.4 percent in October, mostly on reduced chemical, machinery and motor vehicles and parts orders. Still, sales of manufactured goods have risen 4.3 percent year-over-year. In addition, retail spending jumped 1.5 percent in October, with Canadians spending a whopping 6.7 percent more over the past 12 months. Meanwhile, the unemployment rate fell to 5.7 percent in December, its lowest rate “since comparable data became available in January 1976.” Yet, manufacturers lost 3,600 workers on net for the month. In 2017, however, the sector added 85,700 employees. Mexican manufacturing activity expanded for the second straight month, rebounding from the recent earthquake, but slowed a little in December. The IHS Markit Mexico Manufacturing PMI decreased from 52.4 in November to 51.7 in December. The mild contraction in October had been the first decline since July 2013. Despite expanding in the latest survey, respondents noted slowing new orders (down from 54.9 to 53.0), output (down from 51.4 to 50.9), exports (down from 52.6 to 51.7) and employment (down from 51.8 to 51.3). This easing extended to the future output index (down from 71.8 to 64.2), which decelerated to an 11-month low despite continuing to suggest general optimism in the outlook for the next six months. However, Mexico also continued to underperform. Along those lines, real GDP decelerated from 1.9 percent year-over-year in the second quarter to 1.5 percent in the third quarter, its slowest growth rate since the fourth quarter of 2013. Industrial production edged down 0.1 percent in November, falling for the third straight month. On a more positive note, manufacturing production grew 0.6 percent, with modest year-over-year growth of 2.2 percent. Still, output growth in the sector has drifted lower since achieving a 5.0 percent year-over-year pace in May. Meanwhile, the unemployment rate edged down to 3.4 percent in November, with that measure hovering between 3.2 percent and 3.6 percent for most of 2017. It has drifted lower since registering 4.1 percent in September 2016. Chinese manufacturing activity expanded for the seventh consecutive month. The Caixin China General Manufacturing PMI ticked up from 50.8 in November to 51.5 in December, its best reading since August. Stronger growth in new orders (up from 51.8 to 53.0), output (up from 51.3 to 52.1), future output (up from 53.0 to 53.8) and exports (up from 51.5 to 52.6) boosted the headline index. Despite easing in the rate of decline in the latest survey, net hiring continued to contract (up from 48.6 to 49.1), which it has done every month since October 2013. In addition, the official manufacturing PMI from the National Bureau of Statistics of China edged down from 51.8 in November to 51.6 in December. Medium-sized and large firms reported expanding activity levels, whereas small manufacturers cited lingering weaknesses. The Chinese economy grew 6.8 percent year-over-year in the third quarter, edging down slightly from 6.9 percent in the first and second quarters. Industrial production has decelerated over the past few months, down from 6.6 percent year-over-year in September, to 6.2 percent in October, to 6.1 percent in November. Similar trends have occurred for fixed asset investment, which has slowed from 8.6 percent year-over-year in June to 7.2 percent in November, and for retail sales, which have eased from 10.9 percent year-over-year in June to 10.2 percent in November. With that said, retail spending picked up slightly in the latest release, up from 10.0 percent year-over-year in October. Several new reports for December will be released on January 18. Japanese manufacturing expanded modestly at its fastest rate in nearly four years. The Nikkei Japan Manufacturing PMI rose from 53.6 in November to 54.0 in December, its highest point since February 2014. Still, the underlying data showed mixed activity. New orders (up from 54.9 to 56.6) and exports (up from 54.9 to 56.5) both increased, with stronger demand—which was also at the best reading since February 2014—lifting the headline number. Yet, output (down from 54.2 to 54.1), future output (down from 58.1 to 58.0) and employment (down from 53.2 to 52.4) each slowed a little, while continuing to grow modestly in December. Real GDP grew 0.3 percent in the third quarter, slowing from 0.6 percent growth in the second quarter. That translated to 1.7 percent year-over-year growth, which, despite the easing in the latest data, was the best year-over-year rate since the second quarter of 2015. Industrial production increased 0.6 percent in November, extending the 0.5 percent gain in October. On a year-over-year basis, industrial production has risen 3.7 percent since November 2016. Manufacturing activity in the emerging markets expanded modestly in December at the best rate since January 2013. The IHS Markit Emerging Markets Manufacturing Index increased from 51.7 in November to 52.2 in December. More importantly, the headline index has now expanded for 18 straight months, reflecting improvements in the emerging markets over that time frame. In December, the underlying data all increased, including new orders (up from 53.0 to 53.6), output (up from 52.5 to 53.3), exports (up from 51.7 to 52.0) and employment (up from 49.7 to 50.3). Hiring expanded for the first time since February 2015. In addition, future output continued to reflect general optimism about the next six months (up from 59.7 to 60.5). The country-by-country data provided mixed results, but a number of emerging markets made marked improvements in December. For instance, the Czech Republic expanded at its fastest pace since February 2011 (up from 58.7 to 59.8), mirroring many of its European neighbors, with Taiwan also achieving its best readings since early 2011 (up from 56.3 to 56.6). Most emerging market economies notched gains in the latest surveys, including China (up from 50.8 to 51.5), Hong Kong (up from 50.7 to 51.5), India (up from 52.6 to 54.7), Nigeria (up from 55.2 to 56.8), Poland (up from 54.2 to 55.0), Russia (up from 51.5 to 52.0), the United Arab Emirates (up from 57.0 to 57.7) and Vietnam (up from 51.4 to 52.5), with some of those countries achieving multiyear highs. At the same time, slightly slower—but still positive—growth occurred in Myanmar (down from 51.6 to 51.1), the Philippines (down from 54.8 to 54.2) and Saudi Arabia (down from 57.5 to 57.3). Encouragingly, Kenya (up from 42.8 to 53.0) continued to rebound strongly in the latest data from the fastest rate of decline in the survey’s history in October (34.4). Political unrest had plagued Kenya’s economy. In contrast, Egypt (down from 50.7 to 48.3), Malaysia (down from 52.0 to 49.9) and South Korea (down from 51.2 to 49.9) slipped into contraction territory in December. Lebanon (down from 46.2 to 46.1) and South Africa (down from 48.8 to 48.4) also continued to struggle. The U.S. trade deficit rose in November to its highest level since January 2012. The U.S. trade deficit rose from $48.91 billion in October to $50.50 billion in November. In the latest figures, the increase in the trade deficit stemmed mostly from a jump in goods imports (up from $199.41 billion to $205.46 billion) that was more than enough to offset an increase in goods exports (up from $130.18 billion to $134.57 billion). At the same time, service-sector exports rose to a new all-time high (up from $65.60 billion to $65.66 billion), with the service-sector trade surplus edging up from $20.32 billion to $20.40 billion. The underlying goods exports data rose for the most part, led by increased exports for non-automotive capital goods (up $2.47 billion). Other gains in goods exports included automotive vehicles, parts and engines (up $963 million), consumer goods (up $662 million), industrial supplies and materials (up $240 million) and foods, feeds and beverages (up $112 million). At the same time, as noted above, goods imports also rose sharply in November, including for consumer goods (up $2.39 billion), industrial supplies and materials (up $2.18 billion) and non-automotive capital goods (up $1.58 billion). Administration prepares for several deadlines on enforcement-related matters, while action following reports awaits. The Trump administration has several upcoming deadlines on actions begun in 2017, including reports due on Section 232 investigations on steel (deadline January 16) and aluminum (January 24). The reports may not, however, be made public, and the president has up to 90 days after the report is sent to take action in each investigation. Other active actions include a Section 201 investigation on solar cells, in which President Trump has until January 26 to issue a decision in the case, including whether to impose remedies and what remedies to use. Another Section 201 case on washing machines is close behind, with a decision due on February 3. The administration is also working on Section 301 investigation into Chinese intellectual property (IP) and technology transfer issues, which is not due until August but is expected to be completed as early as this month. In addition, the administration still has several reports finalized but not made public in 2017 on the trade deficit, trade agreement implementation and violations and reciprocal government procurement agreements. If any of these reports are issued publicly, they may set the stage for further administration trade enforcement or negotiation activity. For additional information, contact NAM Vice President of International Economic Affairs Linda Dempsey. Manufacturers score victory with defeat of Garrett nomination; reinvigorate push for Senate confirmation of four pending Ex-Im Bank nominees. In a bipartisan vote on December 19, the Senate Banking Committee rejected Scott Garrett’s nomination to lead the Ex-Im Bank due in significant part to the months of forceful advocacy from manufacturers and aggressive state and national advertising from the NAM. At the same time, the NAM urged the Senate to move quickly to confirm the other four nominees to get the Ex-Im Bank back to operating at full strength. After failing to act on the other four nominees (Kimberly Reed, Spencer Bachus, Judith Pryor and Claudia Slacik) by the end of the first session, the Senate acted by unanimous consent to hold over these nominations so they are ready for floor consideration this year. A similar effort to hold over Garrett’s nomination was rejected, and his nomination was returned to the White House. The administration would have to renominate Garrett for him to go through the confirmation process and has not yet done so. On January 9, NAM President and CEO Jay Timmons reinvigorated the NAM’s advocacy by sending this letter to Senate Majority Leader Mitch McConnell (R-KY) and Majority Whip John Cornyn (R-TX), urging them to move the four Ex-Im Board nominees expeditiously to return the bank to full functionality. The NAM also continues to support congressional efforts to include a fix to the quorum issues as part of Congress’s 2018 appropriations process. For additional information, contact NAM Vice President of International Economic Affairs Linda Dempsey. NAFTA negotiators hold December technical discussions in Washington, D.C., in advance of the sixth round of talks in Canada in January. The United States, Canada and Mexico met for a so-called intersessional meeting in Washington, D.C., from December 11 to 15, during which chief negotiators held two days of high-level discussions on rules of origin, and the three sides continued to work through other technical and less controversial issues, including digital trade, state-owned enterprises, customs and trade facilitation, regulations and technical standards, energy and textiles. The next major round of talks will be held in Montreal, Canada, from January 23 to 28. President Trump noted his goal to highlight the importance of renegotiations during his speech at the American Farm Bureau Federation’s annual convention on January 8. The president and vice president have also been meeting with senators and governors, who have been outlining their goals for a positive NAFTA modernization. Consistent with the NAM’s NAFTA paper and its detailed recommendations for modernization, the NAM continues to communicate directly with senior officials throughout the administration and on Capitol Hill regarding the NAM’s priorities and issues of concern. For more information, contact NAM Vice President of International Economic Affairs Linda Dempsey and NAM Director of International Trade Policy Ken Monahan. U.S. and Korean negotiators hold talks on the KORUS FTA. The United States and South Korea met on January 5 for the first formal round of talks that aim to improve implementation and potentially amend the KORUS FTA. According to a statement issued by the Office of the U.S. Trade Representative (USTR), “The United States discussed proposals to move towards fair and reciprocal trade in key industrial goods sectors, such as autos and auto parts, as well as to resolve additional cross-cutting and sector-specific barriers impacting U.S. exports.” After the meeting, Ambassador Robert Lighthizer said, “We have much work to do to reach an agreement that serves the economic interests of the American people. Our goals are clear: we must achieve fair and reciprocal trade between our two nations. We will move forward as expeditiously as possible to achieve this goal.” Reports indicate that the Korean government also raised issues related to investor-state dispute settlement and trade remedies. The next meeting is expected to take place soon, though a date has not been announced. The talks started following a request from the United States in July, and the two governments held two special sessions of the KORUS Joint Committee (August 22 and October 4) prior to the January meeting. The KORUS FTA has been important to improve the competitiveness of many manufacturers throughout the United States by eliminating barriers, raising standards and ensuring strong enforcement. The NAM, in close coordination with our members, continues to work to ensure full implementation of all parts of the agreement and to promote even greater manufacturing opportunities through the U.S.–Korea commercial relationship. For more information, contact NAM Vice President of International Economic Affairs Linda Dempsey and NAM Director of International Trade Policy Ken Monahan. At the strong urging of the NAM, Congress sought to consider and pass the Miscellaneous Tariff Bill Act of 2017 by the end of last year, but time ran out. The NAM continues to lead industry efforts to urge passage of the bipartisan MTB legislation as quickly as possible in 2018. The NAM estimates that the MTB would eliminate import tariffs of more than $1.1 billion over the next three years and boost U.S. manufacturing output by more than $3.1 billion. For more information, contact NAM Director of International Trade Policy Ken Monahan. USTR seeking public comments on global IP barriers. On December 27, USTR issued an open call for submissions on key challenges facing U.S. stakeholders related to global IP protection to be used to draft this year’s Special 301 report. Comments are due to USTR by February 8, with the final report slated for release in April. The NAM is planning to file a formal submission for this year’s Special 301 review—as the NAM did in 2017—and is requesting formal input from members on country-specific IP challenges no later than close of business on January 12. For more information about the NAM’s work on global IP issues, contact NAM Director of International Business Policy Ryan Ong. Senate, House advance legislation to reform U.S. reviews of foreign investment. Senate Majority Whip John Cornyn (R-TX) and Sens. Dianne Feinstein (D-CA) and Richard Burr (R-NC), joined by Rep. Robert Pittenger (R-NC), introduced the Foreign Investment Risk Review Modernization Act (FIRRMA) (S. 2098 and H.R. 4311) on November 8. FIRRMA is designed to expand and update the Committee on Foreign Investment in the United States (CFIUS) review process, including by expanding the scope to cover a broader range of transactions, such as overseas joint ventures, IP transactions, minority investments and real estate transactions. FIRRMA also modifies the list of national security factors CFIUS should consider in its analysis, changes key definitions, such as “critical technology” and “passive investment,” and makes other changes to CFIUS filing and appeal procedures. The legislation does not name specific countries, but it instead provides processes related to “countries of specific concern”—a grouping that is largely understood to have a particular focus on China and Russia—as well as a country “whitelist” for U.S. treaty allies and other designated countries. Given the legislation and the corresponding increase in interest on foreign investment reviews, the Senate Banking and House Financial Services committees have both held hearings on investment reviews, most recently on January 9 in the House. The NAM has been monitoring this legislation closely and engaging both NAM members and Capitol Hill. To participate in this work or get more information on these issues, or to get additional information about the NAM’s work on foreign investment, contact NAM Vice President of International Economic Affairs Linda Dempsey and NAM Director of International Business Policy Ryan Ong. Manufacturers call for a robust strategy to tackle international standards and regulatory barriers. On December 18, the NAM issued a call to action, urging a strong, coherent approach to address foreign standards, conformity assessment and regulatory barriers impacting manufacturers in the United States, particularly small and medium-sized businesses. In detailed comments sent to the U.S. Department of Commerce, the NAM called for stronger efforts to tackle foreign market access barriers related to standards and regulation, recommended specific reforms to Department of Commerce programs to aid manufacturers grappling with international standards and affirmed priority technical regulatory barriers facing NAM members in key markets, including the European Union, Saudi Arabia, China, India, Canada, Mexico and others. For more information about the NAM’s work on international standards and regulatory issues, contact NAM Director of International Business Policy Ryan Ong.